Comfort Option - Are Foam Mattresses Hotter than Innerspring Mattresses? They Don't Have to Be. It’s a common perception that foam mattresses can potentially sleep hotter than other mattresses, and it’s true that they can. What needs to be understood, however, is that it would be misguided to conclude that foam mattresses are always hotter than innerspring mattresses. If you’re worried about sleeping hot on a new foam mattress, here’s what you need to know. The facts about owner complaints. Not all foam is created equal. Innovative fabrication helps air flow. The percentages of mattress owners that complain about sleeping hot on foam mattresses are lower than you think. The summary is that yes, memory foam and foam mattresses have reports of owners sleeping hot. But, not as many as you might think. Just under 10% of memory foam mattress owners report sleeping hot. About 6% of innerspring mattress owners report sleeping hot, only a 4% variance compared to memory foam. Foam mattresses actually have LESS reports of owners sleeping hot than innerspring mattress owners at just over 5%. Why would that be? What’s the difference between foam and memory foam? There are literally hundreds of different foam types that could go into mattresses, and each offers different benefits. When Robert Taylor Elliott founded Foamcraft, Inc. in 1952, there were three foam types. When his son Robert W. Elliott took over a few decade later, the product line had doubled! All the way to six. In 2016 Foamcraft, Inc. carried over 100 foam types. 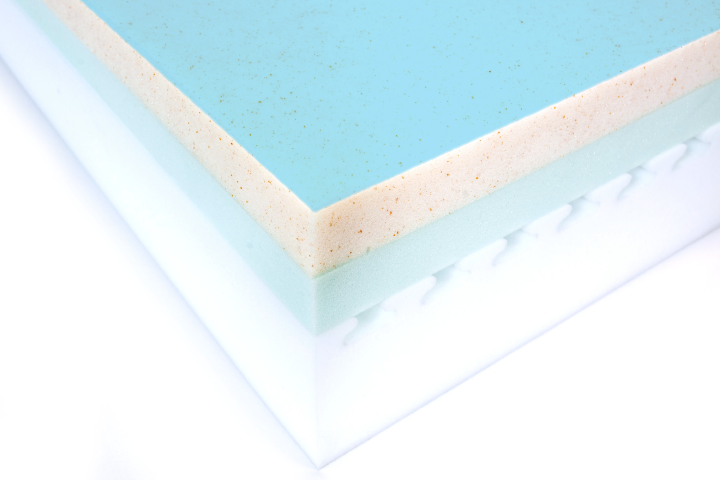 Foam is not all the same, and when you hear the term “foam mattress'“ that does not have to mean that memory foam is included. Memory foam is a great a product. It has incredible pressure relieving capabilities, has a very attractive hand feel and it limits motion transfer in a mattress so you can’t tell when the person sleeping next to you is tossing and turning. But it’s not perfect. The density and chemistry of the product have traditionally limited air flow. Thus, the reason memory foam has more reports sleeping hotter than other types of foam is based on air flow. The problem is getting less and less though as foam manufacturers focus on this issue. Basically every new memory foam that’s launched now has some kind of cooling story - maybe it’s gel infused, maybe it has a metallic conductor added in to move heat away from the body. But, there also has to be some kind of air flow story if a foam mattress is going to compete from a cooling standpoint with materials that inherently have air flow - like innersprings and latex. The biggest issue with foam compared to innerspring is the differences in air flow. However, creativity in the fabrication process can be a serious help. It used to be that a foam mattress were just a whole bunch of slabs glued together. Not so anymore. Automated CNC fabrication equipment has given the industry some pretty unique ways of adding pressure relief and air flow to foam. Comfort Option’s foam core uses a unique CNC design called I-Beam, which provides consistent air flow from the head to toe during the entire night’s sleep. The bottom line is that unless there is some kind of a fabricated solution to bring in air flow, a foam mattress will never match an innerspring mattress in terms of air flow. At the end of the day, whatever temperature is at the surface of the mattress is what you’re going to feel. From Comfort Option’s perspective, we’ve always sought to utilize the latest cooling technology in each of our customized mattress constructions. Whether it’s our copper-infused memory foam to conduct heat away from the body rather than simply absorbing the hear, high-airflow memory foam, or any of the temperature neutral or responsive foams that we use in our constructions, each material we utilize was selected, in part, for the cooling properties it brings to the table. Now, we are excited to announce the latest addition to our product line: the addition of KulKote – Temperature Regulating Technology to our mattresses. If you’ve experienced our SoftFlo Pillows, you’re already familiar with the seemingly-magic, immediately-tangible cooling that KulKote brings. If you’re unfamiliar, KulKote is a water-based, polymer coating that is applied to the surface of the foam; it is a “phase change material” (PCM) which, in short, means that it utilizes micro-capsules that continually change phases from a liquid to a solid in order to effectively manage heat energy. In other words, it regulates your temperature while you sleep and keeps your mattress at a perfect, comfortably-cool level all night long. It actually works. The graphics below show the tangible temperature difference that KulKote brings. KulKote is now offered as an optional upgrade on all Comfort Option customized mattress constructions, as well as our Alpha mattresses. There’s an up-charge for a product like this, but if temperature is primary concern in pursuing a foam mattress, it’s the best option to consider. What kind of foam is it? Does it have a coating?